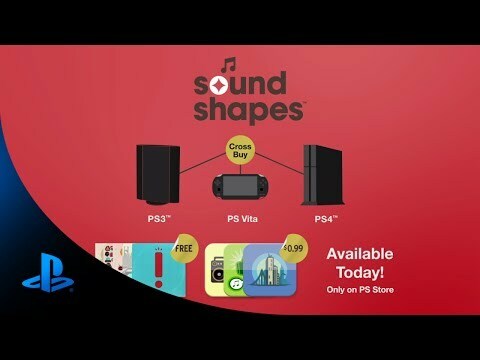 Play, Compose and Share in award-winning Sound Shapes™ now on the PS4™ system. Equal parts instrument and game, Sound Shapes™ gives everyone the ability to make music. Play through a unique campaign that fuses music and artwork into a classic 2D platformer, featuring artwork by Pixeljam, Capy, Superbrothers and more, with music by I Am Robot and Proud, Jim Guthrie and Deadmau5. Create your own unique musical levels with all of the campaign content and share with the world. Sound Shapes creates an ever-changing musical community for everyone to enjoy at home or on the go. SHARE your musical creations with the PS4™, PS3™ and PS Vita Sound Shapes community. Awarded Best Handheld Game by the Game Critics Awards two years in a row, Sound Shapes is also a cross-platform title allowing players to take it on the go with PlayStation®Vita system or play at home on their PS4™ or PS3™ systems. Purchase the PS4™, PS3™ or PS Vita versions of Sound Shapes through PS Store and receive the other versions at no additional cost. Sound Shapes is a trademark of Sony Computer Entertainment America LLC.